This program is only available for Qualified Eligible Persons (QEP). What is QEP? Brandywine Asset Management’s investment philosophy is based on the belief that the most consistent and persistent investment returns across a variety of market environments are best achieved by combining multiple uncorrelated trading strategies – each designed to profit from a logical, distinct return driver – into a truly diversified investment portfolio. As a result of this belief, Brandywine Asset Management’s founder and CEO, Michael Dever, has developed and employed hundreds of unique futures trading strategies over the past thirty years. These strategies incorporate a diverse range of variables, including: fundamental, seasonal, sentiment, arbitrage and technical factors – the majority of them producing returns that are uncorrelated to trend following futures traders. 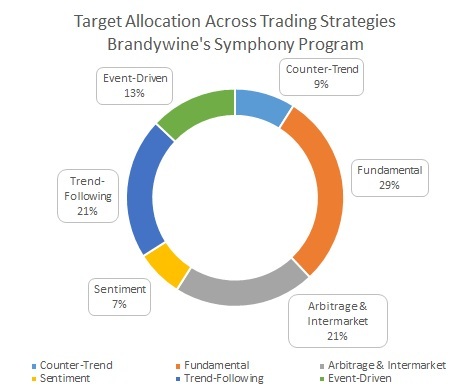 Brandywine Asset Management also employs short and longer term trend following strategies to ensure that Brandywine Asset Management’s Symphony Program is positioned in the direction of major trends when they occur. As a result, Brandywine Asset Management tends to be uncorrelated to trend following traders during choppy market periods (when its performance is dominated by its fundamental, arbitrage and other non-trend strategies), but correlated to trend following traders during strongly trending periods. This favorable performance profile means that adding Brandywine Asset Management to a portfolio of trend following traders can increase the portfolio’s risk-adjusted rate of return, sometimes substantially. Past results are not necessarily indicative of future results. The risk of loss in trading futures, options and off-exchange forex can be substantial. Strategy Types: In addition to market diversification across all available market sectors, Brandywine Asset Management incorporates dozens of independent trading strategies into its trading model. For presentation purposes, Brandywine Asset Management has aggregated these trading strategies into six “Strategy Types”, as illustrated in the chart below. As is evident from the chart, Brandywine’s uncorrelated returns to trend following futures traders during choppy market periods are the result of having a preponderance of strategies that are based on variables that are dissimilar to those underlying long-term trend-followers. A key element in the success of Brandywine Asset Management’s multi-strategy approach is its proprietary portfolio allocation model, which balances trades across multiple independent trading strategies and markets. This model was originally developed in the late-1980’s by Brandywine Asset Management’s founder in combination with outside researchers from three universities. The model takes into account the fact that some strategies, by design, are specific to certain markets (such as fundamental, which also includes seasonal and event strategies), while others can be more broadly applied (such as short and long-term trend and sentiment strategies). Because of this the model is designed to dynamically adjust the weightings among each of the trading strategies and markets in the portfolio to account for the calculated risk and profit opportunities being signaled by the interaction of the various strategies operating in each market. Brandywine Asset Management’s Symphony Program would not be possible if it were not for the fact that many of the strategies developed by Brandywine Asset Management and its principals over the past three decades continue to be valid today. This enabled the Symphony Program to be built on the back of this cumulative expertise. That said, in keeping with the philosophy underlying Brandywine Asset Management’s multi-strategy approach, Brandywine Asset Management is firmly dedicated to conducting ongoing research designed to further diversify its trading model. Account Size and Portfolio Characteristics: Brandywine Asset Management’s Symphony Program requires a minimum account size of $5 million. Clients may employ notional funding in the funding of their accounts equal to no less than 30% of their nominal account value. The average margin-to-equity ratio for a portfolio is approximately 10%. The program trades approximately 1,000 round-turn contracts per year per million dollars under management. 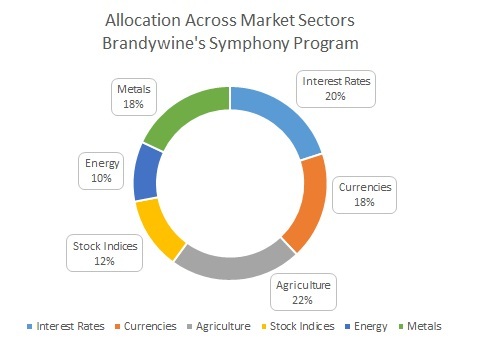 Brandywine Asset Management’s Symphony Program is targeting 12% annualized returns with 9% maximum drawdowns. Michael P. Dever is the founder, principal and CEO of Brandywine. Michael Dever began trading futures in 1979 and founded Brandywine Asset Management in 1982. The Brandywine Asset Management managed futures programs were conceived of during the 1980’s, a decade of extensive discretionary trading by Michael Dever. During that period he developed and cataloged hundreds of trading ideas and research techniques derived from his immersion in the markets. In 1987 Michael Dever began a massive research project in order to combine all of his concepts together into a systematic trading model. The project entailed combining Michael Dever's trading experience with specialized scientific, statistical and mathematical research skills. The initial phase of the project took four years and combined the talents of Brandywine Asset Management's own in-house researchers and programmers with the specialized skills of more than one dozen academic researchers from three different Universities. The resultant Brandywine Benchmark Program, launched in 1991, traded in more than 100 futures markets using more than three dozen strategies. The result was performance uncorrelated to traditional investments and other CTAs, and most importantly, performance that in actual trading tracked the Program’s prior simulated performance. Past results are not necessarily indicative of future results. The risk of loss in trading futures, options and off-exchange forex can be substantial. The Brandywine Benchmark Trading Program was a top-performer throughout the 1990’s, managing hundreds of millions of dollars in client capital. The Benchmark Program was one of the most broadly diversified managed futures programs in existence. Brandywine Asset Management’s Symphony Program is built on this 30-year legacy of research and trading. It is the product of the cumulative research and trading experience of Brandywine Asset Management’s principals and incorporates many of the same trading strategies Brandywine Asset Management originally developed in the late 1980s and early 1990s and that remain valid today. Michael Dever headed in a new business direction when he became an Internet pioneer with his founding of Spree dot com in 1996. Spree dot com grew to become the 7th most trafficked ecommerce site by the fall of 1998. That growth led Michael Dever to focus on managing spree dot com, while other managers took over the day-to-day operations of Brandywine. Subsequent to raising a $13 million venture round, Michael Dever left spree in 1999 and founded Mind Drivers, a venture development firm focused on creating and building highly scalable Internet businesses. After a decade of success in operating Mind Drivers, Michael Dever handed over its day-to-day operation to his long-time partners and founded Ignite LLC (Ignite operated a fund that traded electricity virtuals and futures from 2008-2010), and in 2010 re-focused his attention and energy on Brandywine. In 2011 Michael Dever published the best-selling book, Jackass Investing: Don't do it. Profit from it., in which he exposes 20 common investment myths and provides readers with specific actions they can take to exploit many of those myths. In the book he introduces the concept of "return drivers," which are the basis for the trading strategies incorporated in Brandywine Asset Management's Symphony program. Michael Dever has been a featured subject of three books and he and his businesses have been the subject of numerous interviews and articles in publications including: Bloomberg Television, The Wall Street Journal, Barrons, Computer World, Information Week, the Philadelphia Inquirer, Philadelphia Business Journal, Wall Street & Technology, Futures Magazine, Futures & Options World, Forbes Magazine and Fox Television. Michael Dever received a bachelor’s degree in Business from West Chester University in 1981.